Ginger is wonderful. She’s awesome with the kids, gentle on my gums, but best of all, I swear she knows it all. The first time I walked in, she eyed my bag and mentioned her love of fabrics. Well, that got me started and soon we were exchanging blog sites. At my cleaning in January, Ginger asked how things were going and I vented. 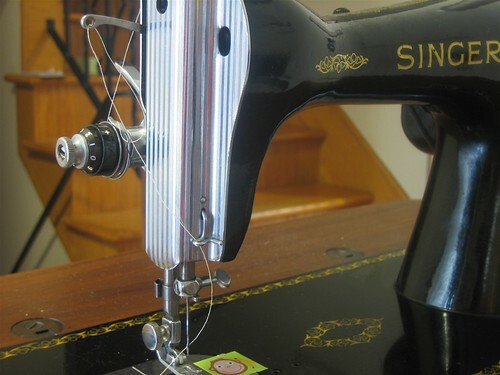 I had recently bought a used Bernina 1630, but I kept having a hog-load of trouble with it. I had just taken it in for service and the repairs cost almost as much as I paid for the machine. (Loooong story and one I don’t feel like boring you with.) I felt depressed because sewing seemed to cost more money than I could afford. Ginger asked why I bought another machine. She asked what features I used and what was important to me. She helped me figure it out. It was all rather simple. 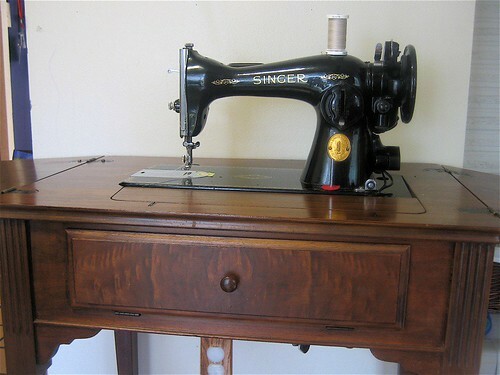 All I wanted was a machine to sew a beautiful straight stitch and to do it through anything I threw at it. I wasn’t asking for alot, but it seemed like my last machine purchases, Janome and Bernina, were just not cutting it. It’s all me. I am very hard on machines. I don’t have patience. I push, pull, yank and shove fabric through. I go from one layer to 15 and expect the machine not to flinch. I want the stitches to look the same on the right side as well as the wrong side. I don’t want jagged, skipped or crooked stitches. Now that I have a couple years sewing under me, I no longer need the speed control, needle up-down, and auto-backstitch. Yes, these features are wonderful to have, but for me they are no longer necessary. Ginger convinced me to get back to the basics. She told me to find a classic machine. Find one from built between 1930-1960. Find a Singer. It took me less than two weeks. And I gotta say, Ginger was right. I found this classic beauty for $50 which included everything. Stella is in her original cabinet and has just about all her original feet. She was used very little and is in wonderful condition. This is now my #1 machine. The only time I use a different machine is if I need a zig-zag or free arm which is really less often than you think. 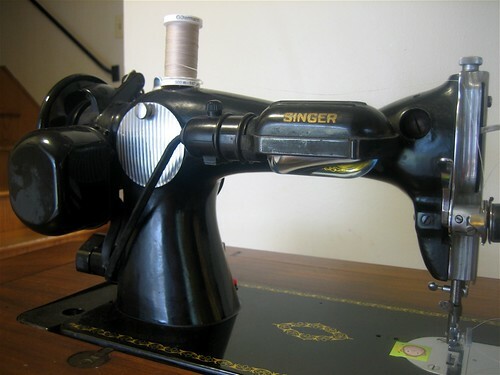 Between my serger and this Singer, I rarely use any other machine. My number one feature with Stella is her quiet hum. It’s quieter than any other machine by far. 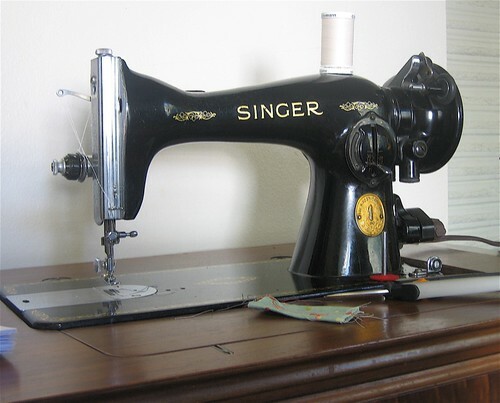 She hums when she’s winding a bobbin, sewing through layers of canvas or sewing at breakneck speed. Yes, she’s fast. You can drop her feed dogs and whip out some easy free motion quilting. 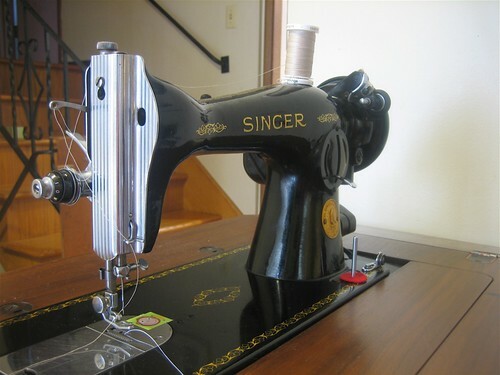 Her bobbins hold a ton and she has a large harp (the space under the sewing arm) for easy quilt maneuvering. There were tons of these made and the parts are easy to find. Best of all, they’re cheap! I serviced Stella myself when I brought her home. Since she was recently serviced by the previous owner, all she needed was oil. All her parts were easy to reach. There weren’t any computer boards to worry about frying or little compartments to figure out how to open. You can see all her parts! She’s all metal with gears and a cute little “pot” motor hanging off her backside. Okay, that’s about it. I have much more to say about these old machines, but since many of you probably stopped reading already, I’ll better stop as well. 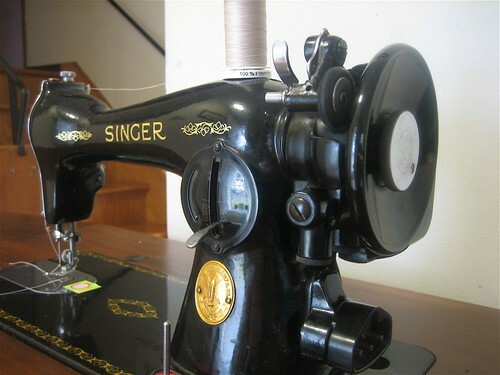 I just wanted y’all to know that there is a machine out there that doesn’t cost thousands, that you can service yourself (with a little time & research), and that sews beautifully. There’s one out there waiting for you so don’t be scared to pick one up. These classics have been around forever and I suspect they’ll be around for many more. Burda- to the point, stylish, no frills, classic, and best of all- perfect sizing. Burda 9644 will be sewn over and over again. I absolutely love this dress. I love the perfectly fitted neckline which lies nicely against Ms O’s neck. It’s not gathered or covered in bias tape. It’s a simple yoke with a little interfacing and a facing. I think I like facings. I never thought I’d say that since I could not understand why you had to cut out another piece of fabric when you won’t even see it. I’ve discovered that a facing is a simple way to get that neat edge and nice fit with out alot of junk. 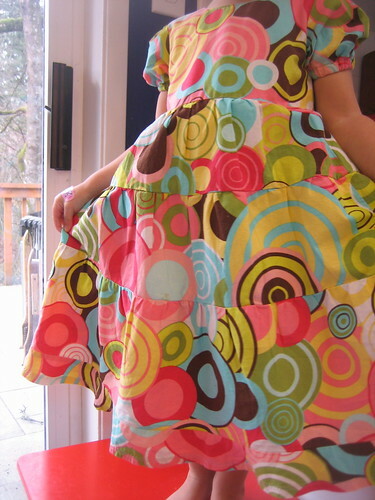 And the tiers- although it takes a little more time to cut out 4 layers of skirt and gather it all- it’s worth it. I’m lucky in that my gathering foot works really well and I’ve learned how to control the amount of gathers. It takes a tiny bit of practice, but I did it and you can too. I must say that I think she looks more adorable now. 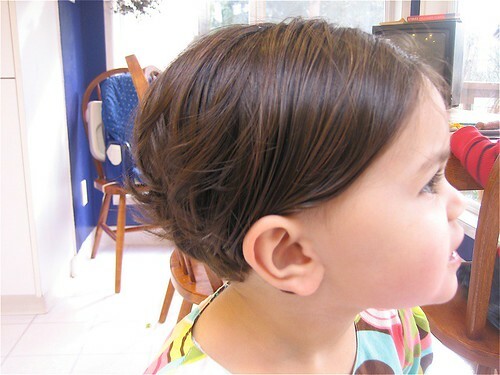 It still gets a little wild in the morning, but short hair on little girls is the way to go. No more cringing from the hairbrush or dictating how many ponytails she wants today. A couple barrets and we’re good to go. So, go out and try a Burda pattern and cut that hair! You won’t regret it. This week we had DAYS of gorgeous sun, but also had two openings. 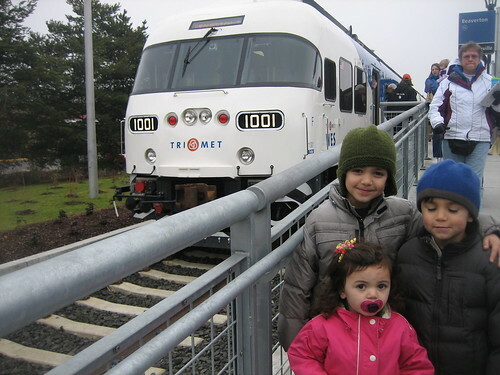 The first is the highly awaited transit line, WES, which connects Wilsonville to Beaverton. We’ve been looking forward to this train for awhile now because it gives us another option than driving or taking the bus to either city. For us, Wilsonville is south on I-5 and Beaverton is west. Either city is a bear to drive to when it’s rush hour, but now we have options. The kids and I went and loved it. The interior is warm and cozy with soft seats! It costs around $2 and kids are free. 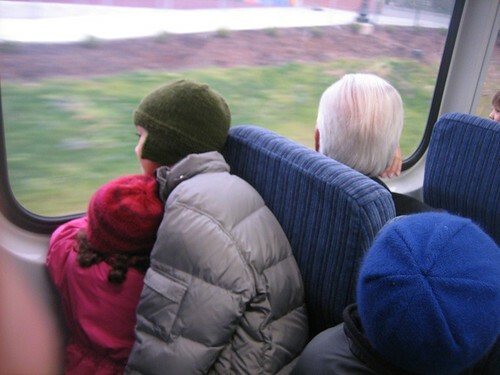 It’s not like our other rail line- MAX– in that it runs on diesel power and uses the regular railroads. Our WES station is about a 2 mile walk from home, but I have a feeling we’ll be walking to this great little adventure often. The other opening is our new little park! Woo-hoo! We’ve walked here just about every day this week and have enjoyed every feature. 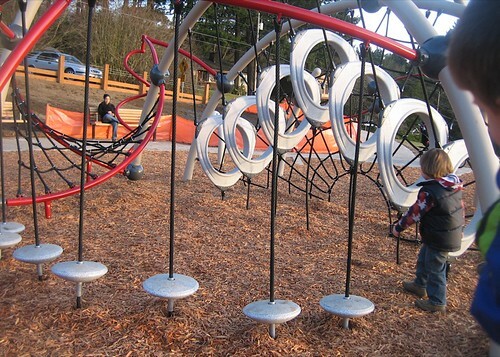 Since it’s on a huge grass field which is used by many, the park is more of a “sculptural” playground. 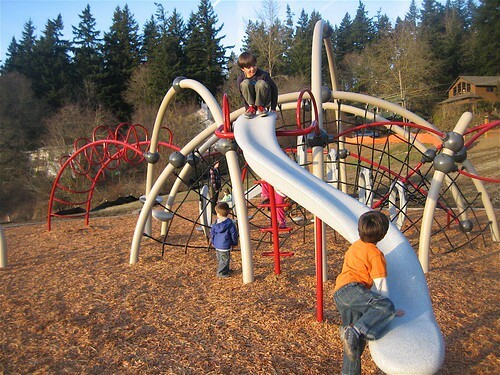 The kids love all the climbing options and Eddie is addicted to the rail-less slide. (I’ve tried it and it’s way scarier than you think.) It’s been so much fun having a park we can easily walk to in 10 min. Before, if we wanted to play at a park, we had to drive or pack a meal and stretch before our 3-mile hike. So Fini, houses are at an all time low, new park, new cheap train, nearly two weeks of dry weather- how about it?